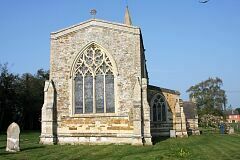 Church, mostly late C13th/early C14th. The west tower is distinctly earlier than 1300. 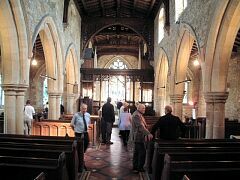 The last medieval contribution was the clerestory, which runs the full length of the nave and chancel. 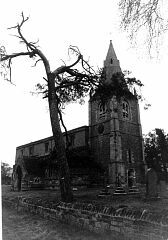 The church was restored in 1868. Parish Church. C13, late C13 tower, chancel, aisles and arcades rebuilt early C14, clerestory added late C15. Restored 1867 by Joseph Goddard of Leicester. Roof repaired 1914. C19 vestry. West tower, nave, north aisle with north porch, south aisle, chancel, vestry. Coursed ironstone rubble with ashlared limestone dressings. Lead and plain tile roofs. Heavily moulded plinth. Coped parapets. Angle-gabled buttresses with set-offs. West tower, 3 stages with broach spire. Second and third stage bands. Decorative cornice. Angle buttresses at north-west and south-west corners. West elevation has modernised doorway with moulded, shouldered flat arch and plank door. Above, a C13 lancet with chamfered jambs and hood mould. Above, a 2-light pointed arch bell opening, the lights divided by a single shaft with moulded capital and base, with a hood mould. North, south and east elevations have similar bell openings. South elevation has C19 clock face in second stage. Spire has corner pinnacles and two tiers of alternating lucarnes. 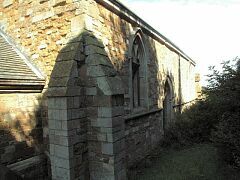 North aisle has north porch added by Joseph Goddard in 1868. Plain tile roof with coped gables with kneelers and finial. Heavily moulded doorway with engaged shafts and hood mould with head stops. Eat and west walls have a single, small window each. North doorway has a double chamfered arch with a plank door. To west of porch, a 2-light window with reticulated tracery and hood mould with head stops. East of porch, a 3-light window with intersecting tracery and hood mould with head stops. North aisle has 3-light east window with reticulated tracery and hood mould with head stops. Chancel, north wall, has a 2-light window with reticulated tracery and hood mould with plain stops, and to east, a 2-light window with Y-tracery and hood mould. 4-light east window with flowing tracery, cross finial to gable. Clerestory over both nave and chancel has five 2-light windows with cusped heads set in rectangular frames, with straight hood moulds with returned stops Three windows light the nave, two the chancel. 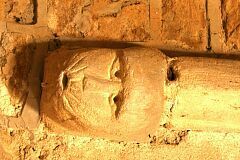 South aisle, south doorway, has moulded jambs with engaged shafts, hood mould with head stops and plank door. To west, a 2-light window with intersecting tracery and hood mould with head stops. To east, a 3-light window with intersecting tracery and hood mould with head stops. South aisle has 2-light east window with reticulated tracery and hood mould with plain stops. Chancel, south wall, has 2-light window with geometric tracery and hood mould with plain stops, and to east, a 2-light window with Y-tracery and hood mould with plain stops. South side of clerestory similar to north. 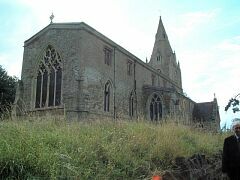 Late C19 vestry between south aisle and tower, with plain tile roof, coping, stone chimney and 2-light west window. 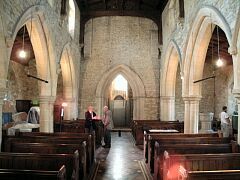 Interior: 3 bay nave arcades with double chamfered, pointed arches and early C14 quatrefoil piers with moulded capitals and bases. North-east pier and responds, capitals have ballflower decoration. Triple chamfered tower arch with hood mould and headstops, and piers with capitals and bases. Roofline of earlier nave visible above. 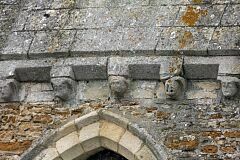 North aisle has reset corbel heads on either side, above doorway. 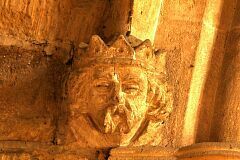 South aisle has reset corbels of c.1200 on south side of arcade and on either side of south doorway and south-west window. Rood stair doorway at east end. 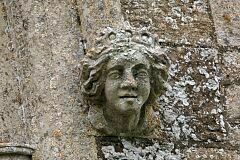 Chancel has moulded string throughout. All windows have hoods, the north-east window with headstops. Early C14 piscina and damaged sedilia. 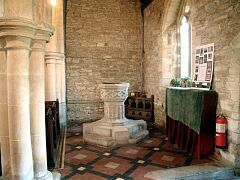 Late C15 octagonal bowl and stem font, carved with foliage and tracery. 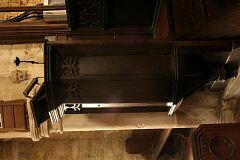 Polygonal pulpit appears to incorporate panels of c.1500, otherwise late C19. Pews and screen are late C19. Organ provided by Hanbury charity in 1952. Stained glass in east window of north aisle depicting farming scenes, to memory of James Kendall (1933-69). East window of south aisle has glass to memory of George Kendall (1847-1926). Glass in east window by Heaton, Butler & Bayne, c.1868. Roofs restore din 1868, 1914 and 1978. 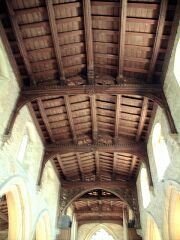 Elaborate carving, brattishing and bossing on moulded C15 tie beams in nave and chancel. Late C19 tile floors. 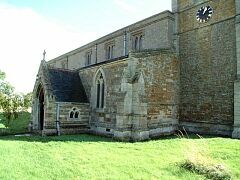 In the Matriculus of 1220, Thorpe is stated to be a chapel of the church of Langton. 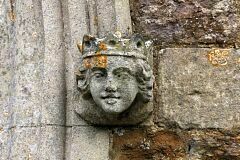 Project Gargoyle survey work in 2011 noted that most of the church was built in the thirteenth century, with the chancel aisles and arcades rebuilt in the early fourteenth century and a clerestory added in the late fifteenth century. 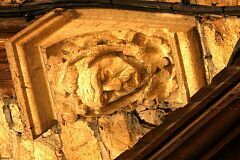 Most of the carvings are original although some are from the 1867–8 restoration. 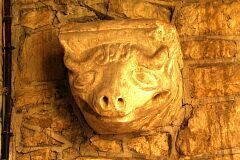 The corbels mostly depict human heads although one is bovine. 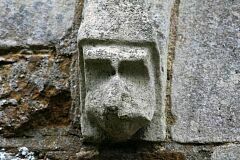 One carving might be ape-like although is more likely a stylised human face. 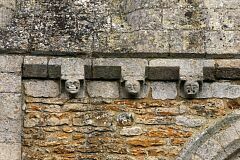 The simple hood stops on the exterior of the south wall are original. 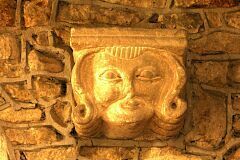 They could be thought of as over-stylised human faces although best described by the phrase ‘hint heads’. 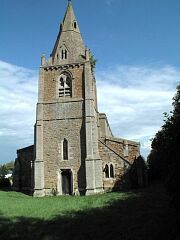 <1> Pevsner N, 1984, The Buildings of England Leicestershire and Rutland, p406 (Bibliographic reference). SLE4. 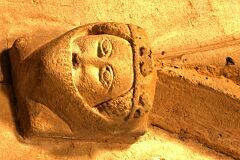 "Mostly of the late C13 to early C14. The W tower is distinctly earlier than 1300. Twin bell-openings not yet with any tracery. Short broach-spire with pinnacles on the broaches. Two tiers of lucarnes in alternating directions, the lower with twin openings divided by a shaft. Again no tracery. 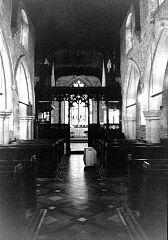 S aisle with shafted doorway. S aisle E window reticulated; the S ones with Y and intersected tracery, cusped only in the main lights. S arcade with quatrefoil piers and double-chamfered arches. Hoodmoulds on head stops. The N arcade is the same, but there is a pretty enrichment with ballflower in the E pier and E respond capitals. 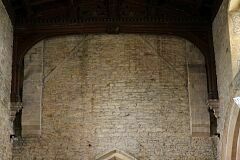 The last medieval contribution was the clerestory, which runs the full length of the nave and chancel. No chancel arch. Joseph Goddard rebuilt the N aisle and added the N porch in 1868. Of the same time the roofs (very elaborate carving in nave and chancel), seats, and screen. - FONT. 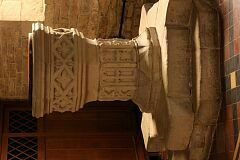 Perpendicular, octagonal, with tracery motifs on shaft and bowl. It stands on two steps. - PULPIT. Perpendicular, polygonal. - STAINED GLASS. E window by Heaton, Butler & Bayne, probably of 1868." <1> Bibliographic reference: Pevsner N. 1984. The Buildings of England Leicestershire and Rutland. p406.